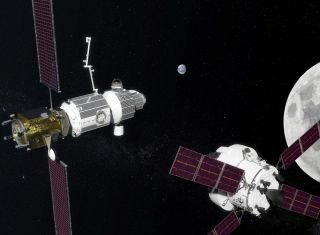 An artist's concept of NASA's deep-space gateway, an orbital outpost in cislunar space that would serve as a stepping stone for crewed Mars missions. NASA and the Russian space agency Roscosmos have announced a new partnership for human exploration of the moon and deep space. Both agencies signed a joint statement on cooperation today (Sept. 27) at the 68th International Astronautical Congress in Adelaide, Australia. The decision to partner with Russia on human missions to the moon and beyond came about as NASA continues to flesh out ideas for its "deep-space gateway" concept, a mission architecture designed to send astronauts into cislunar space — or lunar orbit — by the 2020s. Traveling to and from cislunar space will help NASA and its partners gain the knowledge and experience necessary to venture beyond the moon and into deep space. Roscosmos and NASA already work together with other space agencies around the world to run research projects aboard the International Space Station. Now the international partners will work together to build a miniature space station in lunar orbit – a type of infrastructure that could serve as a steppingstone for future crewed missions to Mars, NASA officials said. In a separate statement, Roscosmos officials said the new partnership would "develop international technical standards … for the establishment of the station in the near-moon orbit." According the Roscosmos, the partners also discussed the possibility of using a Russian superheavy rocket to complete construction of the orbital moon station. "At the first stage, [the deep-space gateway] is supposed to use the American superheavy SLS in parallel with the domestic heavy rockets Proton-M and Angara-A5M," Roscosmos officials said. "After the creation of the Russian superheavy rocket, it will also be used [for] the lunar orbital station." However, those plans are not concrete at this point, and NASA will continue to work with Roscosmos to research the best ways to transport astronauts to and from cislunar space. "While the deep space gateway is still in concept formulation, NASA is pleased to see growing international interest in moving into cislunar space as the next step for advancing human space exploration," Robert Lightfoot, NASA's acting administrator, said in a statement. "Statements such as this one signed with Roscosmos show the gateway concept as an enabler to the kind of exploration architecture that is affordable and sustainable," Lightfoot added. Meanwhile, NASA is also asking the private space industry to contribute to the deep-space gateway. The agency has already awarded contracts for deep-space habitat designs to Bigelow Airspace, Lockheed Martin, Orbital ATK and others.